When you want to add a picture to a document on your Mac, you can add it in either of two ways: as a floating object (which you place in a particular spot from which it doesn’t move, even if you make changes to the text) or as an inline object (which flows with the surrounding text as you make layout changes). Add a floating object. 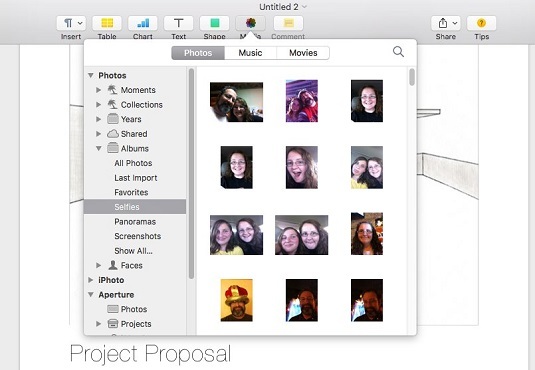 Drag an image file from a Finder window and place it at the spot you want within your document. Alternatively, you can click the Media button on the toolbar and then choose Photos, which takes you to the Media Browser, which displays images from Photos, as well as other locations on your Mac. Navigate to where the file is saved, and drag the image thumbnail to the spot you want to place the image in the document. You can send a floating object (such as a shape or an image) to the background, where text doesn’t wrap around it. To bring back a background object as a regular floating object, click the object to select it and choose Arrange →Bring to Front. Add an inline object. Hold down the Command (⌘) key while you drag an image file from a Finder window and place the image where you want within your document. You can also click the Media button and choose Photos to display the Media Browser. Navigate to the location where the file is saved, hold down the ⌘ key, and drag the image thumbnail to the spot where you want to place it in the document. To move an image, click it to select it and then drag it to the new location within your document.